Due to the success of the 1982 painting project I was asked to create yet another painting for the 1983 event and also to host a luncheon for the wives of the golf participants. What an honor! Because I love daisies I had fresh daisy centerpieces and even flew in fresh crab meat for crab cakes as our lunch entree. 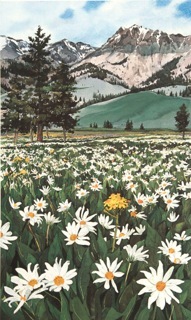 My print, “Mountain Daisies”, was used for the invitation and name tags. Betty Ford was invited to be our guest speaker. I was a nervous wreck anticipating having to introduce Mrs. Ford. I’m just fine talking one-on-one, but a microphone and podium terrify me. Somehow I made it through the introduction and she graciously, and briefly spoke a few words. But to my dismay, she said ”I’m sure you didn’t come today to hear me speak, now may I reintroduce Linda to you.” I was horrified! With not a word prepared I stumbled through, not certain how long I actually spoke, but did in fact, get back to my seat with much relief! My mother and sister Jan accompanied me to the luncheon for moral support and by the end of the luncheon the two Bettys, my mother and Mrs. Ford, were good buddies! Earlier that morning my husband asked me to inquire of Mrs. Ford if it might be possible to get one of the prints of the tournament signed to him as a birthday gift. I hoped she might agree and would take the print home for Mr. Ford to sign, but to my amazement she said “Sure! Just stop by the house this afternoon and I’m sure he will be glad to!” We ventured to Beaver Creek to their lovely home and after clearing security the guard walked us to the front door and we rang the bell. To our utter amazement who should answer the door? Bob Hope! He smiled warmly and said ”Come on in. We’ve been waiting for you!” Mr. & Mrs. Ford and Delores Hope were coming down the stairs and greeted us as if we were friends and all four of them signed happy birthday wishes to my husband. Bob Hope had mentioned having to leave within a short time so I said “thank you so much, we don’t want to take up any more of your time, especially if you have a plane to catch.” He smiled, patted my hand and said “Don’t worry honey… when it’s your plane… they wait for you!” So we bid our gratitude and farewell and in stunned silence returned to our car. The print (and the story!) are cherished keepsakes ’til this day!